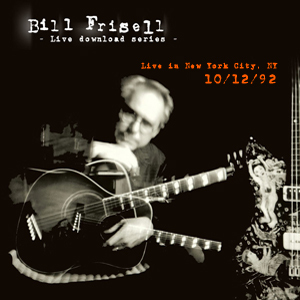 Also from New York, but recorded four years earlier, Download Series #009 predates Frisell's 1994 masterpiece, This Land, but finds that album's sextetâ€”Driscoll and Baron augmented by Fowlkes, Byron and alto saxophonist Billy Drewesâ€”performing the month before the album was recorded, and clearly working the material in preparation for its pending studio session. The 75-minute set brings together half of This Land's 14 tunes, and is a perfect lesson in the difference between what works live, and what works in the studio. In some ways, live recordings go against their being moments in time that, once past, are gone forever, as opposed to studio recordings, where the goal is to create music that intentionally stands the test of time. Of course, many live recordings do stand the test of timeâ€”and this, along with the rest of the Live Download Series, is one. But comparing the extended versions hereâ€”the knottily freewheeling, 18-minute version of "Resistor," at nearly triple the length of the take on This Landâ€”makes a strong case for greater concision when aiming to create the definitive studio version.